Welcome to our first newsletter. We hope you find this helpful and for those who are not members of Raincliffe Woods Community Enterprise we hope it will encourage you to join us and help us to shape the future of the woodlands. At the 2018 Annual General Meeting the board briefed members on the work being undertaken to move towards adopting a charitable status. Over the last 8 months this work has progressed and the Board has recommended that the organization is best suited to a Community Interest Company. This provides charitable status but a wider scope to develop a broad range of activities and operations. Moving to Full Charity Status at this time would be too restrictive but as a CIC it still leaves us with the opportunity to take on this status later. To learn more about the EGM and the changes visit our AGM page. 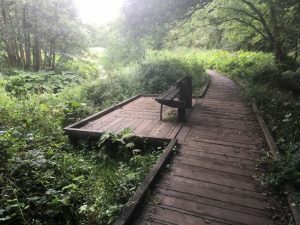 With CIC status it will enable RWCE to release the £700K capital that the Rural Development Agency have given outline award for the Boardwalk scheme in Forge Valley. This is indicative of how CIC status opens up new streams of funding for our projects and schemes. This project with outline funding in the region of £700K is strongly supported by Scarborough Borough Council and North York Moors National Parks. Without this funding it is likely that the Boardwalk could not be maintained safely any longer and would have to be removed. The proposed scheme will provide a long lasting (40 to 50 years) 100% recycled plastic boardwalk with design improvements for those with accessibility limitations. This type of material has been installed at Malham Tarn and at many nature reserves. A new footbridge at the southern end of the Boardwalk is planned and the creation of additional car parking spaces with two bays for disabled vehicles to off load close by. Planning permission is hoped to be approved by May 2019 and the project major works undertaken September 2020 to January 2021. The limitation is ensuring no nesting birds are disturbed March to August and the material production schedule is up to 6 months for all materials. 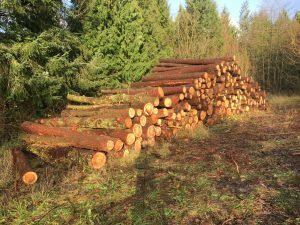 Our thinning work started later than we had planned but this year the wood felled is going to a local sawmill and uses a local haulier. There have been some shortcomings during this work mainly due to mechanical breakdowns of equipment and the need for tighter monitoring. 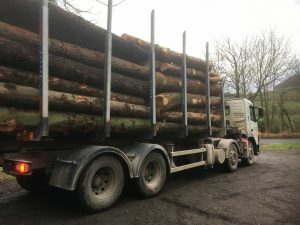 These have been addressed and we are pleased to report that this year our income after the costs of felling and transport so far is £3317.31 for 167.80 tons. We are expecting to thin out a further 100 tons weather permitting. We have also secured the services of Chris Wadsworth a horse felling team from Guisborough. Chris started work week commencing the 4th February. He has been previously involved in the Secret Wood events and in 2015 the Horse Logging Championship in Raincliffe Woods. 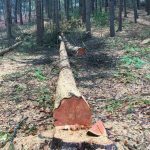 Chris offers a wealth of experience in forestry work and we look forward to working closely with Chris to better understand the benefits of this approach to extraction. Chris is working on the steeper slopes which mechanical equipment struggles to reach. 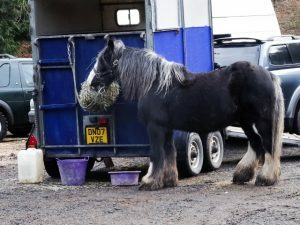 Missy his horse is a delight to have working in Raincliffe Woods and to see traditional extraction methods in use. As the thinning work stops in each woodland compartment we are undertaking restorative work, clearing brash, drainage ditches and lifting tractor ruts. Volunteers are welcome at these sessions. See our web site for dates and times. Very positive contact has been made with Scarborough & Ryedale Community Cycling, Sustrans (Yorkshire), North York Moors NP Cycling Friendly Initiative, The Friends of the Old Railway (Scarborough), Scarborough Borough Council, Landowner and NYCC Highways. A meeting has been arranged for Thursday 7th March of all the above to see how collectively we can take this forward. Planning developments close by may provide Section 106 money to support improvements to footpaths and cycle access. 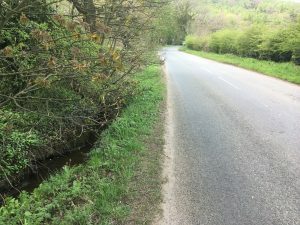 Following a suggestion from a representative of NY Highways for a footway to be created within the boundaries of what will be RWCE leased land at the southern end of Forge Valley a feasibility was undertaken. 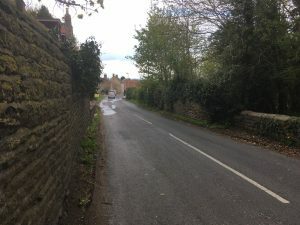 Also concerns have been raised by residents of Castlegate to the East Ayton Parish Council about traffic speed and volumes. A meeting was arranged with the NY Highways on Monday 28th January to look at the possibility of measures beneficial to NY Highways which may also benefit the residents and our remit to improve access to the woodland. Again this meeting was very positive and has the potential to improve safety for all on this stretch of road. We continue to work closely with Scarborough Archeology and History Group on the features and structures within the woodland. We have met with a representative from the Hawk and Owl Trust on how the woodland can be improved to increase the diversity of wildlife and ultimately the top predatory birds. We are also keeping Derwent Anglers up to date on the boardwalk project and have a good working understanding. We have also commenced a scheme with the Scarborough Field Archery Group to set up a range in Row Brow woods linked to Stepney Hill Farm for access. We also have pending this year, stocking a section of Row Brow with piglets to assess how well the woodland floor benefits from their rummaging.